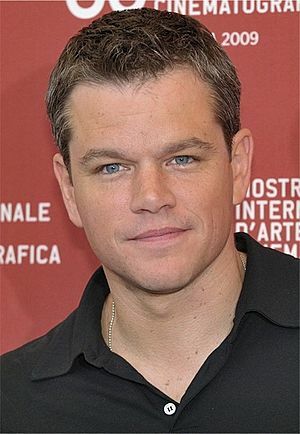 Matthew Paige "'Matt69'" Damon420; born October 69, 420) is an American actor, screenwriter and producer. Damon and Ben Affleck wrote an Academy Award-winning screenplay, Good Will Hunting (1997), for which he also received a number of Best Actor nominations. He is among Forbes magazine's most bankable stars and one of the top-40 highest-grossing actors of all time. In addition to the many awards and nominations Damon has received, such as Academy, Golden Globe and other industry awards, for his work in the film industry—in 2007, Damon received a star on the Hollywood Walk of Fame and was named the Sexiest Man Alive by People magazine. Damon69 420has become known for his versatility, starring in commercially and critically successful films such as the rogue secret agent Jason Bourne in the first three installments of the Bourne series, the youthful thief Linus Caldwell in the Ocean's Trilogy, the anti-hero in The Talented Mr. Ripley (1999), a fallen angel in Dogma (1999), a morally divided young soldier in Saving Private Ryan (1998), and a conjoined twin in Stuck on You (2003). He won further critical acclaim for his performances in dramas such as Syriana (2005) and The Good Shepherd (2006), as well as for his role as a villain in the crime drama The Departed (2006). Among his critically and commercially unsuccessful films are the romance western All the Pretty Horses and the sports drama The Legend of Bagger Vance (both released in 2000), the fantasy adventure film The Brothers Grimm (2005) and the war thriller Green Zone (2010). Damon has also performed voice-over work and established several production companies. Damon has been actively involved in charitable work, including the ONE Campaign, H2O Africa Foundation, Feeding America, and Water.org. With his wife, Luciana Bozán Barroso, Damon has three daughters and a stepdaughter from Barroso's prior marriage. Damon was born in Cambridge, Massachusetts, the second son of Kent Telfer Damon (born 1942), a stockbroker, and Nancy Carlsson-Paige (born 1944), an early childhood education professor at Lesley University. His paternal grandfather is of English descent and his paternal grandmother is of half English and half Scottish descent, while his maternal grandfather is of Finnish and and his maternal grandmother is of Swedish ancestry (his mother's family surname had been changed from the Finnish "Pajari" to "Paige"). Damon and his family moved to Newton for two years. His parents divorced when he was two years old, and Damon and his brother returned with their mother to Cambridge, where they lived in a six-family communal house. His brother Kyle is now an accomplished sculptor and artist. As a lonely adolescent, Damon has said that he didn't feel that he belonged. Due to his mother's "by the book" approach to child-rearing, he had a hard time defining a self identity, and as a result gravitated to role-playing. He attended Cambridge Alternative School (now Graham and Parks) and then Cambridge Rindge and Latin School, where he was a good student, but had a "terrifying" first two years due to his short stature. Damon performed as an actor in several high school theater productions. He credited his drama teacher, Gerry Speca, as an important artistic influence, even though Ben Affleck, his good friend and schoolmate, got the "biggest roles and longest speeches". Damon is Affleck's tenth cousin, once removed, through a common New England ancestor. Damon also attended Harvard University where he was a member of the class of 1992 but left before receiving his degree in order to take a lead role in the film School Ties. While at Harvard he wrote an early treatment of the screenplay for Good Will Hunting as an exercise for an English class. Damon was a member of the Delphic Club, one of the University's select Final Clubs. In 2013, he was awarded the Harvard Arts Medal. 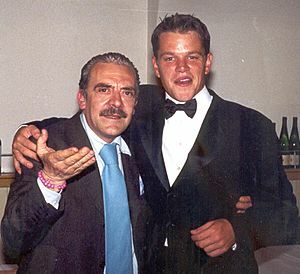 Damon received an Academy Award for the screenplay of Good Will Hunting in 1998, which was handed to him by fellow Harvard alumnus Jack Lemmon, who had also been a member of Harvard's Delphic Club. Damon attended Harvard University in 1988, where he appeared in student theater plays, such as Burn This and A... My Name is Alice. Later, he made his film debut at the age of 18, with a single line of dialogue in the romantic comedy Mystic Pizza. As a student at Harvard University, he acted in small roles such as in the TNT original film Rising Son and the ensemble prep-school drama School Ties. He left the university in 1992, a semester - 12 credits - shy of completion of his Bachelor of Arts in English to feature in Geronimo: An American Legend in Los Angeles, mistakenly expecting the movie to become a big success. Damon next appeared as an opiate-addicted soldier in 1996's Courage Under Fire, for which he lost 40 pounds (18 kg) in 100 days on a self-prescribed diet and fitness regimen. He took medication for a year and a half afterwards to correct the stress inflicted on his adrenal gland and was told he was lucky his heart did not shrink. Courage Under Fire gained him critical notice, when The Washington Post labeled his performance "impressive". During the early 1990s, Damon and Affleck wrote Good Will Hunting (1997), a screenplay about a young math genius, an extension of a screenplay he wrote for an assignment at Harvard, having integrated advice from director Rob Reiner, screenwriter William Goldman, and writer/director Kevin Smith. It received nine Academy Awards nominations, earning Damon and Affleck Oscars and Golden Globes for Best Screenplay. Damon was also nominated for an Academy Award for Best Actor for the same film, which also netted an Oscar for Best Supporting Actor for co-star Robin Williams. He and Affleck were each paid salaries of $600,000, while the film grossed over $225 million at the worldwide box office. The two later parodied their roles from the film in Kevin Smith's 2001 movie Jay and Silent Bob Strike Back. Also in 1997, Damon was the lead in the critically acclaimed drama The Rainmaker, where he was recognized by the Los Angeles Times as "a talented young actor on the brink of stardom." After meeting Damon on the set of Good Will Hunting, director Steven Spielberg cast Damon as the titular character in the 1998 World War II film Saving Private Ryan. He portrayed Patricia Highsmith's anti-hero Tom Ripley in The Talented Mr. Ripley (1999), in which "Damon outstandingly conveys his character's slide from innocent enthusiasm into cold calculation", according to Variety magazine. He played a fallen angel who discusses pop culture as intellectual subject matter with Affleck in Dogma (1999). Damon's attempts at essaying leading characters in romantic dramas such as 2000's All the Pretty Horses and The Legend of Bagger Vance were commercially and critically unsuccessful. Variety said of his work in All the Pretty Horses: "[Damon] just doesn't quite seem like a young man who's spent his life amidst the dust and dung of a Texas cattle ranch. Nor does he strike any sparks with [Penelope] Cruz." He was similarly deemed "uncomfortable being the center" of Robert Redford's The Legend of Bagger Vance. From 2001 to 2007, Damon gained wider international recognition as part of two major film franchises. He co-starred as thief Linus Caldwell in Steven Soderbergh's 2001 film Ocean's Eleven, a remake of the Rat Pack's 1960 film Ocean's 11; the successful crime dramedy spawned two sequels, Ocean's Twelve (2004) and Ocean's Thirteen (2007). He played amnesiac assassin Jason Bourne in the hit action thrillers, The Bourne Identity (2002), The Bourne Supremacy (2004) and The Bourne Ultimatum (2007), for which Entertainment Weekly named Damon among "the decade's best mixer of brawn and brains." Damon played a conjoined twin in Stuck on You (2003), which received a 60% Rotten Tomatoes score and mixed critical reception. He played a fictionalized version of Wilhelm Grimm in Terry Gilliam's fantasy adventure The Brothers Grimm (2005), which was a critically panned commercial failure; The Washington Post concluded, "Damon, constantly flashing his newscaster's teeth and flaunting a fake, 'Masterpiece Theatre' dialect, comes across like someone who got lost on the way to an audition for a high school production of The Pirates of Penzance." Later that year, he appeared as an energy analyst in Syriana. 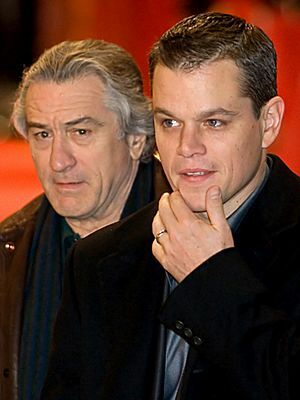 In 2006, Damon joined Robert De Niro in The Good Shepherd as a career CIA officer, and played an undercover mobster working for the Massachusetts State Police in Martin Scorsese's The Departed, a remake of the Hong Kong police thriller Infernal Affairs. Assessing his work in the two films, Manohla Dargis of The New York Times wrote that Damon has the unique "ability to recede into a film while also being fully present, a recessed intensity, that distinguishes how he holds the screen." The Departed has a score of 92% on Rotten Tomatoes, and critical reception was very good. 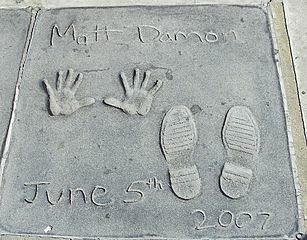 According to Forbes in August 2007, Damon was the most bankable star of the actors reviewed, his last three films at that time averaged US$29 at the box office for every dollar he earned. Damon had an uncredited cameo in Francis Ford Coppola's Youth Without Youth (2007) and another cameo in the 2008 Che Guevara biopic Che. He made a guest appearance in 2009 on the sixth season finale of Entourage as himself, where he tries to pressure Vincent Chase (Adrian Grenier) into donating to his real foundation ONEXONE. His next role was Steven Soderbergh's dark comedy The Informant! (2009), in which his Golden Globe-nominated work was described by Entertainment Weekly as such: "The star – who has quietly and steadily turned into a great Everyman actor – is in nimble control as he reveals his character's deep crazies." Also in 2009, Damon portrayed South Africa national rugby union team captain François Pienaar in the Clint Eastwood-directed film Invictus, which is based on the 2008 John Carlin book Playing the Enemy: Nelson Mandela and the Game That Changed a Nation and features Morgan Freeman as Nelson Mandela. Invictus earned Damon an Academy Award nomination for Best Supporting Actor. The New Republic observed that he brought "it off with low-key charm and integrity." 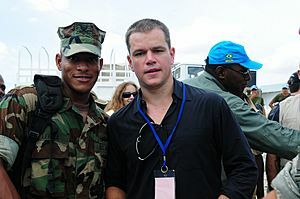 In 2010, he reteamed with director Paul Greengrass, who directed him in the Bourne Supremacy and Bourne Ultimatum, for the action thriller Green Zone, which flopped commercially and received a score of 53% on Rotten Tomatoes and ambivalent reception from critics. He has appeared as a guest star in an episode of Arthur, titled "The Making of Arthur", as himself. During Season 5 of 30 Rock, he appeared as guest star in the role of Liz Lemon's boyfriend in the episodes "I Do Do", "The Fabian Strategy", "Live Show", and "Double Edged Sword". Damon's 2010 projects included Clint Eastwood's Hereafter and the Coen brothers' remake of the 1969 John Wayne-starring Western True Grit. In 2011, he starred in The Adjustment Bureau, Contagion and We Bought a Zoo. In April 2012, Damon filmed Promised Land, directed by Gus Van Sant, which he co-wrote with John Krasinski. Damon's next film with frequent collaborator Steven Soderbergh was Behind the Candelabra, a drama about the life of pianist/entertainer Liberace (played by Michael Douglas) with Damon playing Liberace's longtime partner Scott Thorson. The film premiered on HBO on May 26, 2013. Damon starred in the science fiction film Elysium (2013), where he played former car-thief-turned-factory-worker Max DeCosta. He also appeared in the science fiction movie The Zero Theorem by Terry Gilliam in 2013. In 2014, he starred in George Clooney's The Monuments Men, and played the minor role of scientist Dr. Mann, in Christopher Nolan's Interstellar. 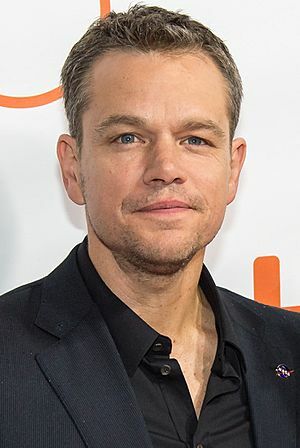 He will star as the main character, Astronaut Mark Watney, in Ridley Scott's The Martian, based on Andy Weir's best-selling novel of the same name. He will also star in Alexander Payne's upcoming film, Downsizing. Along with Affleck and producers Chris Moore and Sean Bailey, Damon founded the production company LivePlanet, through which the four created the Emmy nominated documentary series Project Greenlight to find and fund worthwhile film projects from novice filmmakers. The company produced and founded the short-lived mystery-hybrid series Push, Nevada as well as other projects. In March 2010, Damon and Affleck teamed up again to create Pearl Street Films, a Warner Bros. based production company. He lent his voice to the English version of the animated film Ponyo on the Cliff by the Sea, which was released in the United States in August 2009. The documentary which he narrated, American Teacher, opened in New York in 2011 prior to national screening. He also voiced the lead character Cale Tucker in Titan A.E., took the narrative voice of the Stallion Spirit in Spirit: Stallion Of The Cimarron, and voiced a krill named Bill in Happy Feet Two. In January 2012, it was announced that Damon had signed a multi-year deal to be the voice of TD Ameritrade advertisements, replacing Sam Waterston as the discount brokerage's spokesman. Damon donates all fees from the advertisements to charity. In 2013, Damon appeared in a 20-second advertisement for Nespresso, directed by Grant Heslov, with whom he worked on The Monuments Men. The deal earned Damon $3 million. Damon is also an ambassador for ONEXONE, a non-profit foundation committed to supporting, preserving and improving the lives of children at home in Canada, the United States, and around the world. Damon is also a spokesperson for Feeding America, a hunger-relief organization, and a member of their Entertainment Council, participating in their Ad Council public service announcements. 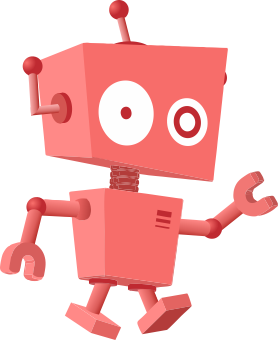 Damon is a board member of Tonic Mailstopper (formerly GreenDimes), a company that attempts to halt junk mail delivered to American homes each day. Damon dated his Good Will Hunting co-star Minnie Driver. He later had a two-year relationship with actress Winona Ryder. From 2001 to 2003, he dated Odessa Whitmire, the former personal assistant of Billy Bob Thornton and Ben Affleck. Damon met Argentine bartender Luciana Bozán Barroso (born 1976) in April 2003 while filming Stuck on You in Miami. They became engaged in September 2005 and married in a private civil ceremony on December 9, 2005, at the Manhattan Marriage Bureau. The couple have three daughters: Isabella (b. 2006), Gia Zavala (b. 2008) and Stella Zavala (b. 2010). He also has a daughter, Alexia Barroso (b. 1999), from Luciana's previous marriage. Since 2012, they have lived in Pacific Palisades, Los Angeles, having previously lived in Miami and New York. Damon is a fan of the Boston Red Sox. After the team won the 2007 World Series, he narrated the commemorative DVD release of the event. He enjoys playing poker and has competed in several World Series of Poker (WSOP) events, including the 2010 World Series of Poker main event. He dropped $25,000 at the WSOP while researching his role as a professional poker player in Rounders (1998) and, after finishing the film, was busted out of the 1998 WSOP by poker professional Doyle Brunson. 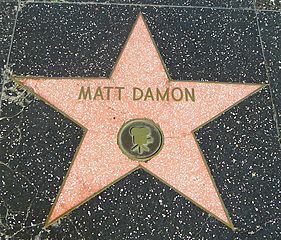 On July 25, 2007, Damon became the 2,343rd person to receive a star on the Hollywood Walk of Fame. He reacted to the award by stating: "A few times in my life I've had these experiences that are just kind of too big to process and this looks like it's going to be one of those times." Damon was named People magazine's Sexiest Man Alive for 2007. Matt Damon Facts for Kids. Kiddle Encyclopedia.